Go on Patricia’s Quest for Sun! As one of the trusted maintainers of her homeworld, Patricia has been given the responsibility of finding Sun. Help her as she explores a foreign planet in the hopes of finding Sun. With the help of the Sense Maker and Patricia's purse of endless things the journey has just begun in this exciting Puzzle Adventure game! Patricia's Quest for Sun is rated 4.5 out of 5 by 22. Rated 5 out of 5 by GraneeJ from Utterly charming I've just rediscovered this game and again find the story whimsically charming and the art work unique and gorgeous. The mechanics are those of a simple block type "jigsaw" puzzle so it isn't particularly complicated to play, more soothing than challenging, which suits me since I play to relax. Rated 5 out of 5 by kukutoo from I love this game, wish there were more like it I really enjoy playing this game. I wish that there were more with this kind of mix/match puzzles. Rated 5 out of 5 by KarenMora from Delightful, Magical This is not a game for everyone. The storyline is positively magical, but not everyone likes to read. The entire game has a delicate cloud feel. As soon as I finished, I went right back and started over. The zen quality of the artwork and story is unlike anything I've ever seen. Rated 5 out of 5 by gmaAlice from It will "draw"n you in This is the second time (possibly third) I’ve played through this game. All along I had the vague feeling I had played before, only not as a puzzle game but as a “quest” game. You know the type, do this mental puzzle to open the door, or speak to the creature and it will give a tool you need. Return and speak again then, answer its question and get a clue to look at a certain object. I was so intrigued with this idea of déjà vu I’m trying to find the “quest” version right now. Rated 5 out of 5 by fish_pal from MY NAME I GOT THIS ONLY BECAUSE IT HAD MY NAME ON THE TITLE BUT ONCE I STARTED TO PLAY, I COULDN'T STOP. MORE PEOPLE SHOULD GIVE IT A TRY. Rated 5 out of 5 by jil1 from What a wonderful game... I love puzzle games and this one is unique!. Although the draws of Patricia and the figures in the story are not the most beautiful, the puzzles are wonderful. I can hardly wait to buy another one like this. I hope the developers create more games following this line. Funny, beautiful, interesting, challenging... Loved! I keep it in my PC and had already played several times... and every time is a pleasure. Rated 5 out of 5 by bluesycat from One of my favorite games EVER! I just finished this beautiful game. It's a straight-ahead jigsaw game with swapped square pieces, but it's much more than that. 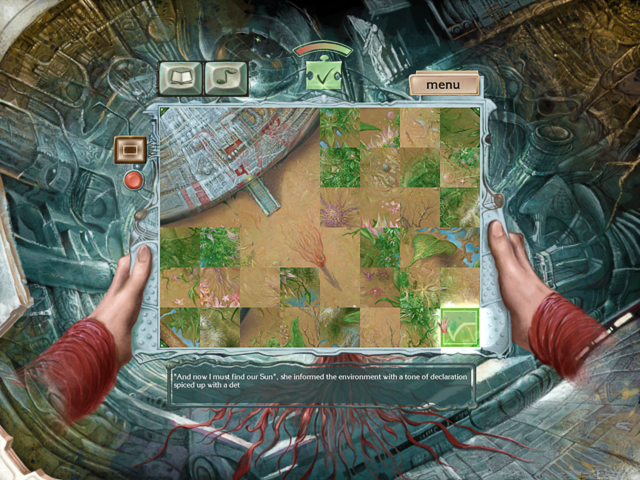 The game is a succession of puzzles, each one a chapter from a book. The scenes and settings are ghostly and surreal. The story itself is pretty surreal as well. The artwork is absolutely beautiful and enticing - and odd. I had so much fun in the early parts of this game that I consciously slowed down so that completing the 20+ chapters took me nearly a month. The only reason I gave 4 stars to the Challenge level was that even in the easier mode, some of the puzzles were very hard, and took me a long time to solve. I wish there were more games as interesting and quirky as this. I haven't enjoyed a game this much since Tiny Bang Story. Rated 5 out of 5 by Tassiegal from A delightful game I found this game very absorbing. The puzzles are all jigsaw-type with square pieces, swapping the pieces to get them in their right places. The artwork is exquisite and the pictures often have slightly muted colours, increasing the level of challenge (all to the good). The artistic style reminded me of some of the best children's book illustrators. Lovely! The music is somewhat otherworldly and quite pleasant. The story is rather rambling but written in a poetic style and this adds to the ethereal quality of the game. I also liked the create-your-own-puzzle option - a nice touch. All in all, a relaxing and enjoyable game. Rated 5 out of 5 by Tikatoy from Endearingly weird game The basic gameplay is sort of like a jigsaw puzzle; imagine a picture that is cut into a grid of small squares, then those squares are jumbled around. You swap those squares around until you form the original picture. That's it. That's the only puzzle in this game. And yet... I couldn't stop playing! This was because of the gorgeous and unique artwork, and creative and bizarre story. I actually got a little emotional at the ending--that's never happened to me with a casual game before! Do check out the demo. While the art style and story really appealed to me, it probably doesn't to everyone. You can get a good feel for the game after playing one puzzle. Rated 5 out of 5 by NCwriter from Unique and mesmerizing I love this game. The reviews were intriguing so I downloaded the trial and knew right away I had to buy it. I'm really tired of the same old dark and dreary HOGs, so this game was a welcome breath of fresh air! The story is enchanting as you follow Patricia on her journey, and the writing conveys the real sense of wonder and curiosity that Patricia feels as she's exploring. I don't usually pay much attention to the storylines of games because I prefer to just jump into the action, but this story was so different it really drew me in. Some people may be put off by lack of instructions, but it's pretty clear what you're supposed to do. The only real hint feature is a magic wand that you can use to place one tile correctly, but I used it only once just to see what it did. After you've been working with a picture for a while, little corners appear on the four corner pieces, so that's sort of a hint if you look for them. The artwork is stunning and looks like acrylic paintings. The music is haunting and lovely, and the puzzles are quite challenging. I'm playing in Normal mode right now, but after I finish the game I'm going to go back and play the Difficult mode to see what the difference is. 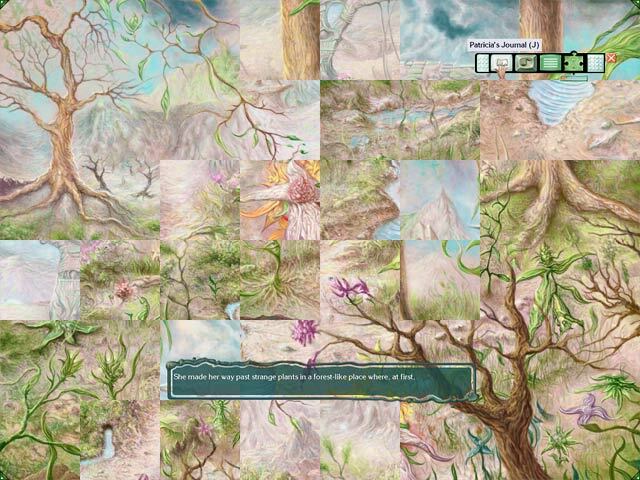 If you like jigsaw puzzles, ethereal artwork, lovely music, and a charming storyline, and you appreciate the challenge of pieces that are all the same shape and size, then this is the game for you. It's a very, very welcome change from the standard fare that BigFish has been offering recently. Love BigFish, but I wish there were more diverse games. I love this game! 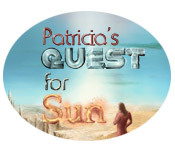 Join Patricia on her quest to find Sun! 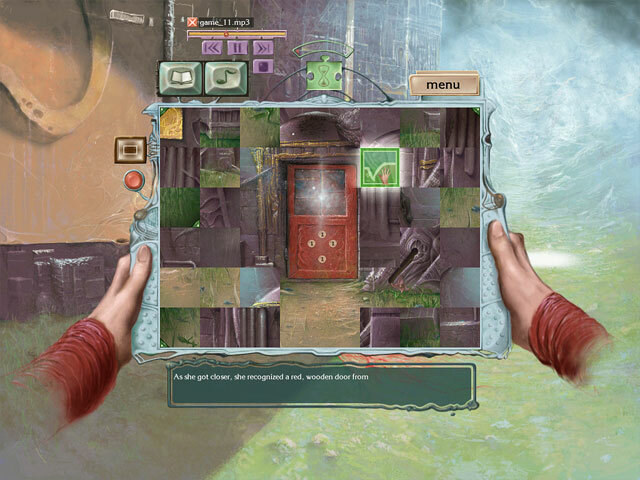 Immerse yourself in this beautiful and exciting Puzzle Adventure game!